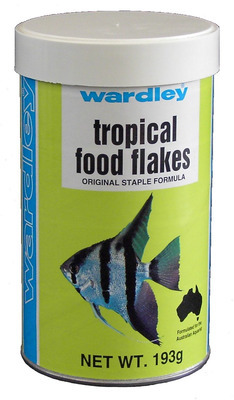 Wardley's Tropical Food Flakes is an homogenized, nutritious basic diet for all species of tropical fish. An excellent replacement diet for live food, this eagerly accepted flake diet will not clould aquarium water if fed properly. Feed several times daily - never more at one feeding than your fish can consume in 5 minutes. Don't overfeed.